Comedians Lu Maw, center Par Par Lay, the Moustache Broters, and their cousin Lu Zaw, at a Mandalay street theater. MANDALAY, Burma -- What do you say when a former political prisoner invites you to his home? This is neither a flippant question nor the beginning of a joke. Burma has been run by military junta since 1962; since 1989, the country's rulers have called it Myanmar. Citizens who criticize the powers that be can be jailed, for years. It was a sweltering, bone-dry afternoon, and tiny clouds of dust billowed around our feet on the dirt streets of Mandalay. My friend Hannah and I were waddling back to the sumptuous Sedona Hotel, after a filling and cheap lunch at the Too Too Restaurant. A dozen small courses had cost just under $5. On the nearly deserted street, a middle-aged man wearing a wide-brim hat and longyi (a sarong-like skirt worn by many Burmese men) slowly pedaled by on an old bicycle. As he looked us over, I was expecting yet another offer to rent a trishaw or a taxi. Instead he called out excitedly, ''Mou-stache Brother!" Seconds later he braked and slowly approached us with a friendly smile. He pointed first to himself, then to my friend's guidebook. Then he exclaimed again, ''Mou-stache Brother!" Sure enough, he sported a mustache and goatee that stood out prominently against his clean-shaven golden skin. But what the heck was this guy selling? He motioned to Hannah's guidebook and she passed it over. He rifled to his desired page, where a photo of himself and his two Moustache Brothers smiled out at us. ''I Par Par Lay, Moustache Brother Number One," he assured us, and leaned back on his bicycle. Now it was Hannah's turn to get excited. ''Oh, yes, he and his brothers perform traditional Burmese theater in their home. They are quite well known, we should go and see them!" Par Par Lay's English was quite limited. After he gave us his card and we agreed to see his act that night, he smiled and wheeled off into the heat. At the 1996 Independence Day celebrations hosted by Aung San Suu Kyi, Lay joked about army generals who took bribes. That time he received seven years, with hard labor and no family visits. Amnesty International's involvement led to his release after four years. Possibly the ultimate punishment is that he is no longer allowed to perform in public. That evening, we hired a cab driven by a slim man in his 30s. ''So, you like to go somewhere tonight?" he asked. ''We'd like to see the Moustache Brothers tonight," I said. ''How about you take us there, and pick us up after their show?" Our driver stared away in silence. ''Um. No. Is not good for me to go there." ''Yes. Is not good. People are watching, who comes and who goes." The man was scared. I wondered if I should be likewise. Instead, I consulted our city map. ''Well, how about you drop us off at this restaurant two blocks away, then we'll meet you there after the show? " He thought about this. ''Yes, at the restaurant." Dust swirled in the occasional car's headlights as we walked down 81st Street. A couple of folks pedaled by on bicycles. Most of the illumination was from people's homes, or the restaurant we had just left. Pretty grim for an evening stroll in a city where electricity brownouts are common. But the energy was flowing in the Moustache Brothers home on 39th Street. Par Par Lay, now dressed in sparkling white shirt and trousers with a natty vest, greeted us as we entered their performance space. The comfortable ground-floor room was bedecked with traditional Burmese puppets and masks, also an aged cabinet with television and VCR. The dozen chairs filled quickly as other travelers arrived. Brother Lu Maw kicked off the evening, welcoming us in fluent English with his energetic comedy routine, beginning with a few comments about his country. He slyly lamented how a galloping inflation rate makes Burmese bank notes obsolete, then quickly shifted to his infatuation with Hollywood starlets, particularly his profound disappointment that when Demi Moore married, he had lost all hope of her being his ''sugar mummy." As Par Par Lay picked up a drum and seemed to wander out the door, Lu Maw glibly recounted his brief reign as Brother Number One during his elder brother's imprisonment. He popped a tape into the VCR and treated us to the scene from ''About a Boy," where Par Par Lay's plight is fleetingly brought to Hollywood's silver screen. I was finally getting the picture. While the military rules, and there is reportedly government surveillance of their home, only foreigners show up. Then Par Par Lay returned, pounding his drum as the two brothers, joined by Lu Zaw (''Moustache Number Three" but in truth a clean-shaven cousin) and an unnamed sister-in-law, sang, joked, and danced their way through the evening. Sadly, the show was over all too soon. 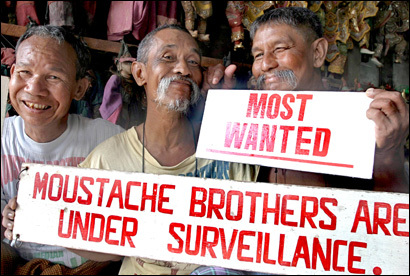 For their finale, the Moustache Brothers crouched together, holding signs with bold red lettering. ''KGB" read Lu Zaw's, Par Par Lay's proclaimed ''Most Wanted," and Lu Maw's warned ''Moustache Brothers Are Under Surveillance." The three grinned widely, reminding me of another brother act by a famous entertainment family -- named Marx. Contact Lloyd Frost at Lloyd1325@yahoo.ca.